Open nearly any diner or local restaurant menu in New England and you’ll see fish and chips as a popular option. The fish in fish and chips is North Atlantic cod. So many people in New England and around the country enjoy fish and chips, but few people know the impact global warming and overfishing are having on New England’s cod population. Global warming, as we know, is caused by an excess of carbon dioxide in the atmosphere. A “side effect” of global warming that’s often referenced is rising ocean levels; however, it might not be clear that the rising ocean levels stem from the ocean becoming warmer. The ocean is naturally resistant to temperature changes because the hydrogen bonds in water form very stable bonds, so a large amount of heat energy is required to break them apart. This means that water can absorb a large amount of heat energy before its temperature rises. The rising temperature of the ocean illustrates how drastic global warming has become. Since the ocean’s temperature is normally very stable, aquatic species are largely accustomed to a specific temperature within their habitat and do not respond well to change. Specifically, the North Atlantic cod has been shown to have difficulty adapting to the warmer water. Cod generally migrate late in the spring and early in the fall; however, with warmer water, that migration pattern could shift to much earlier in the spring and much later in the fall to avoid the warm waters. Cod could also move permanently farther north, or even stop migrating if there is no sea ice left at all. Some populations, particularly those farther south such as in North Carolina and off the coast of southern New England, would become entirely extinct by 2100 if the ocean temperature projections for that time are true. Not only do New Englanders love to eat cod, but cod fishing is also a massive industry across New England and the North Atlantic. 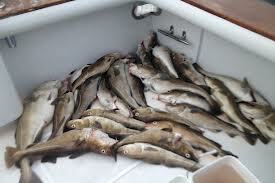 In the mid-1990s, there was a massive drop off in cod population due to overfishing. Since the population was so endangered that the New England Fishery Management Council said they were headed “seemingly inexorably, to oblivion.” In January of 2013, Congress passed regulations on cod quotas in the Northeast: cuts as much as 80% for the next three years off the coast of Maine. While this will hopefully help to raise the population of cod in the North Atlantic, it hurts the local economy. Fishery is a massive industry in New England, and such a drastic cut to an already declining population and struggling industry means that life will become even more difficult to fishermen relying on the next catch. Also, the warming waters might mean that cod populations will not increase to their former abundance even with highly managed fishing quotas. Scientists know that the declining population of cod in the North Atlantic is due to both overfishing and climate change. However, they are not yet sure what the best course is to fix it. Although fishing quotas have been imposed, those also injure the local economy and make it difficult to justify continued cuts on quotas. Additionally, cod is only an indicator for other fisheries across the globe. If all species need to move farther north to avoid warmer waters, what will live in the southern waters? Northern waters do not provide the coral reefs that southern waters do, so a multitude of fish populations that rely on coral reefs could become extinct. All of these issues are just as important as the impacts of global warming on land. The ocean takes up so much of our Earth’s surface, and we depend so deeply on the ocean, from water supply, food, transportation, recreation, and industry. I think we need to pay a lot more attention to what’s happening everywhere in the ocean, from the sea caps to the coral reefs, and including the smaller indicators, like cod, that show us what’s happening in a wider scale.